Preparing comfort food doesn’t always mean unhealthy meals that are overindulgent. In fact, there are many healthy variations on classic comfort meals that taste just as good, if not better, and still provide you with that hearty, warm feeling that makes them so enjoyable. Eating meals full of whole, unrefined ingredients will make you and whoever you share your recipes with feel happy, healthy, and comforted even when the temperature begins to dip. Vegetable Pot Pie – Make individual servings in ramekins to help control portion sizes. Add various vegetables to the filling such as mushrooms, carrots, peas, onion, and celery. Season with spices of your choice. Create a creamy sauce with vegetable broth and flour. Top with phyllo, pie crust, or a biscuit. Meatless Quinoa Chili – Loaded with protein and fiber, this chili is filling and healthy. Select your vegetables of choice. Great options here include tomatoes, onions, bell peppers, carrots, chili peppers, and corn. Add these along with your quinoa, black beans, spices and vegetable broth to a slow cooker and cook for 2.5-3 hours on high or 5-6 hours on low. Top with avocado and sour cream. Baked Pumpkin Macaroni and Cheese – Add almond or coconut milk, butter, flour, spices, and your noodles to a pot and cook until the pasta is al dente and the sauce has become thick. Add in pumpkin puree and cheese and mix. Top with bread crumbs and bake until golden brown. Sweet Potato and Black Bean Enchiladas – In a skillet, add onions and sweet potatoes. Add water, cover, and cook until the potatoes are done. Add spices and black beans and cook for another few minutes. To make the enchiladas, scoop the mixture onto tortillas, roll, and top with cheese and enchilada sauce. Pour some sauce into the bottom of a casserole dish and add the rolled enchiladas. Bake, and garnish with tomatoes, avocados, and more sauce if desired. 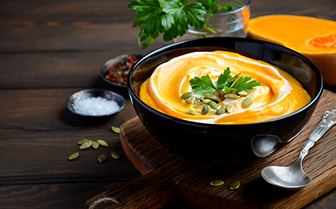 Creamy Pumpkin Soup – Start with boiling water. Add pumpkin, spices, tomatoes, carrots, and green onion. 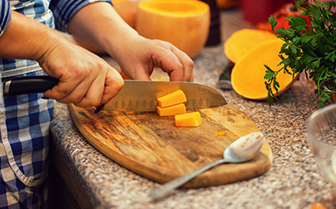 Cook until the pumpkin becomes fork soft. Remove from the heat and blend. Once the soup is smooth, add coconut milk and simmer for 5 minutes to thicken. Shepherd’s Pie – Prepare the meat or vegetable filling. Mix in the accompaniments such as mushrooms, carrots, and onions. Add in flour to coat the mixture and pour broth over top to thicken and create a gravy. Put the mixture into a casserole dish and top with mashed potatoes. Bake, and then broil on low to brown the potatoes. Learning how ingredients affect the body is an important step in becoming a holistic nutritionist. If your love of cooking is matched by your passion for taking care of people in a healthy, natural way, the role of a holistic nutritionist is an excellent career path for you. At the Edison Institute of Nutrition, we offer a variety of online courses to help you establish a new career.